Four-capsule array provides 360-degree coverage through virtual hypercardioid or cardioid outputs with horizontally and vertically tilted steering. 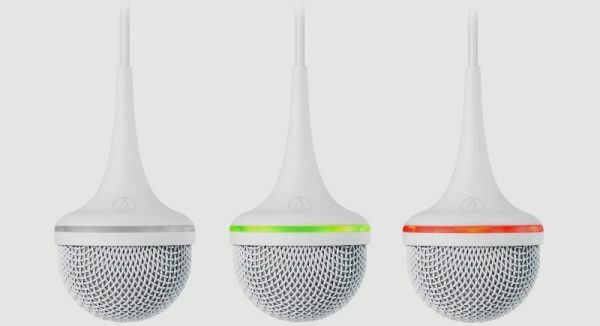 Audio-Technica introduces the ES954 hanging microphone array, a cost-effective solution for huddle rooms, conference rooms and other meeting spaces. When controlled by the Audio-Technica ATDM-0604 digital SmartMixer, the four-capsule microphone array provides 360-degree coverage through virtual hypercardioid or cardioid outputs that can be steered horizontally and tilted vertically. The ES954 hanging microphone array features a permanently attached 1.2-meter (4-foot) cable with locking grommet enabling easy microphone height adjustment. UniGuard RFI-shielding technology offers rejection of radio frequency interference (RFI). The package includes a Plenum-rated AT8554 ceiling mount with RJ45 connectors and push-type wire terminals for simple, secure installation. The ES954 connects to the mixer over a pair of shielded standard Cat 5 cables. Two RJ45 breakout cables are provided to input the four channels, plus an LED conductor, into the mixer. An integral, logic-controlled 360-degree red/green LED ring provides clear indication of the array’s mute status. Alternative seating arrangements in the room can be accommodated by re-orienting each of the four microphone patterns in the mixer’s software. Different seating configurations and associated coverage patterns can be saved as presets in the mixer for quick recall. In larger rooms, multiple ES954 microphone arrays could be installed — for instance, one at each end of a long conference table — and the polar patterns of the multiple microphone arrays steered and widened or narrowed accordingly. 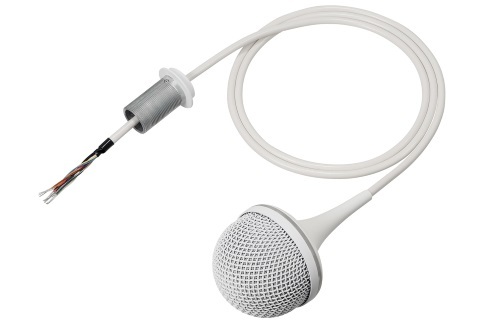 The ES954 hanging microphone array is currently available.